My new charter school project is starting to pay off to some extent. Just this morning, for instance, Ms. Dr. Pam Magee, well-esteemed and intensively bowed-down-before head honcho of that otherworldly bastion of zillionaire privilege known to the world as Palisades Charter High School sent me a big pile of emails between her profusely respected self and the Los Angeles Unified School District in some date range that’s presently escaping me. And for your viewing pleasure I popped the whole steaming pile up to Archive.Org and you can take a look at it right here. And as expected, for such is the nature of CPRA-fueled public interest voyeurism, most of it is tedious chaff. But as is often the case there’s a little bit of gold to be found in there. And the text for today’s sermon is this anxious little exchange between Keith Dell’Aquila, who’s some kind of lobbyist with the California Charter Schools Association, and various “charter leaders” flipping out over a meme he found on the internet about how much charter bosses get paid. He sent the first email on January 18, 2019. Right in the middle of the strike. We wanted to let you know that the names of your schools and reported salaries of senior leaders are being circulated in UTLA-aligned online communities (Twitter and Facebook groups). 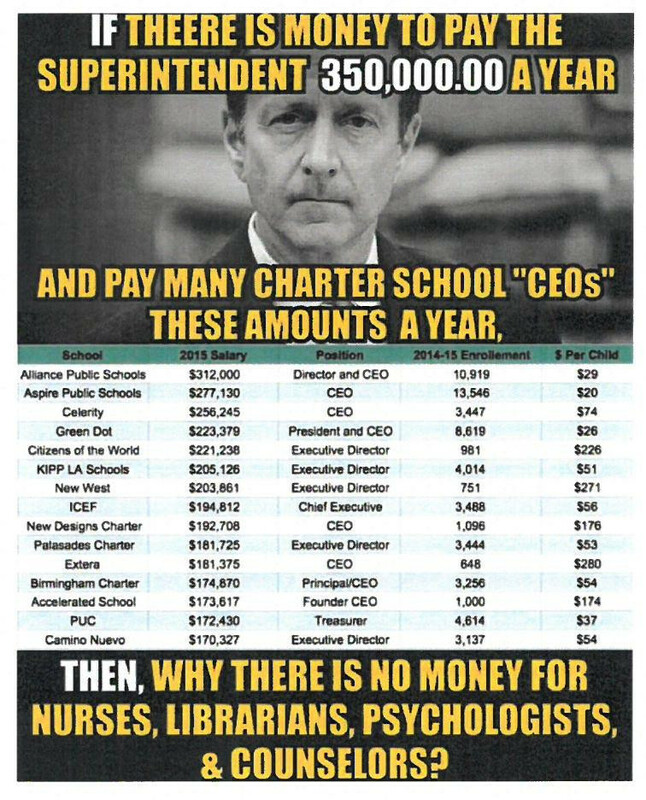 This post does not appear to have been shared widely and does not appear to have been shared by official UTLA accounts or reflected in any media coverage. Still, we want to flag it for you in case it get gains additional traction or if your organizations receive additional attention. Please let us know if you need any support or if you and your schools have been targeted in any way. Thank you for continuing to serve LA students and families well during this challenging time.